Admit it. You love your car. As one of the largest investments you will ever make, your car is not just "transportation" from point A to point B. It's a statement. A love affair. A part of your life. At Performance Services, we understand that relationship. We hate for you to be mad at each other, so our highly skilled (and understanding) service technicians are focused on keeping that new car euphoria intact. what you drove was important to you. Guess what? It's important to us too. Stop in and see us or contact us with questions. At Performance Services, we've been taking care of our clients' vehicles (including some pretty famous local folks) since 1996. Our A.S.E. Certified import technicians live here in town. You'll see them at the grocery store, the ball field and out to eat. So why go out of town for service and maintenance on your BMW, Mercedes-Benz, Volkswagon, Audi, Porsche or other performance import? Our top priority is helping you protect your investment for the long term. The dealerships in Montgomery, Columbus and Atlanta want to sell cars. We know how nerve racking it can be to have car trouble and be from out of town. We've helped a lot of folks who were passing through, but we take special pride and exceptional care when working on vehicles for students from Auburn University and other area colleges and universities. Rest easy, parents. This is their home for now and we treat them like family. 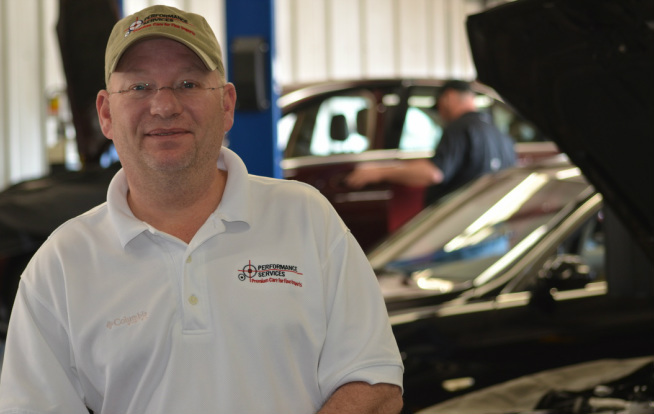 The owner, Frank Jackson (yes, that's him in the big 'ol photo above), will be happy to discuss any mechanical problems your big kid's car may be having. We want both of you to be happy. Just give us a call or tell them to "put us on the line."